A waterproof paint is a product mixed with latex or oil that can prevent moisture from reaching the concrete substance. The presence of latex or oil in the paint is what makes it different from regular paints. It requires a brush, a roller or an air tight sprayer. The application of the waterproof paint should be done on a cleaned surface. If there was an existing paint, it should be scrapped off to leave the surface clean and even. The paint prevents efflorescent and molds from forming on the wall surfaces. Waterproof paints are inexpensive, and it is a readily available product in the market. The main ingredient in this paint is an epoxy resin. Epoxy resin is commonly used in construction industry for waterproofing. This paint is thicker than the regular paints because of the epoxy substance. Epoxy paint provides a permanent coat that is resistant to heat and easy to clean. It does not react with detergent chemicals. It is suitable for both interior and exterior surfaces like garage surfaces and walls. It provides a beautiful finishing in the garage floors, walkways, and driveways. It is highly resistant to water hence suitable for swimming pools. Once the epoxy paint has been applied to a surface, it takes 72 hours to completely dry. Acrylic paints have lasted in the construction industry for over fifty years. Acrylic paint is water-based and is mainly used by the artist because of its shiny nature. The paint provides a durable, beautiful coat that can be installed on floors and woods. No special equipment needed, a roller, a spray and a brush is all you need. The paint takes the time to cure. After it has cured, the surface is made available for users. Its advantage is that it has a high level of elasticity hence can withstand changes in temperature. The main ingredients of this paint are latex and ceramic. It has a high level of absorbing liquids hence can protect the concrete or cement surfaces from water attacks. Masonry paint is recommendable for exterior surfaces. The paint is resistant to dirt, it is durable, and can withstand extreme changes in temperature. Not suitable for swimming pools. It is environmentally friendly and is resistant to UV rays. 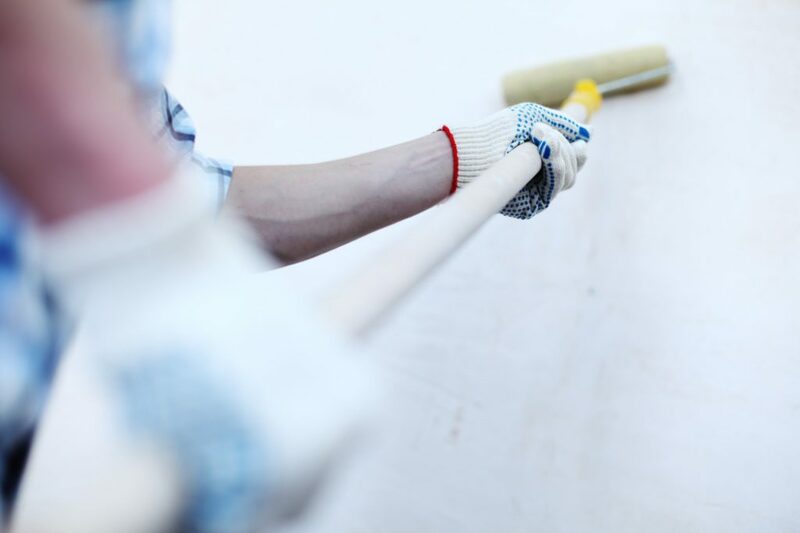 This paint protects concrete surfaces from developing molds and bacteria by keeping away moisture content. This paint is not environmentally friendly because it has toxic substances that can affect your throat, skin, and lungs. Acrylic paint can be mixed with acrolein to make a stronger coat. This type of paint is not commonly used for buildings due to the presence of toxic substances. It provides a protective coat: It shields the underlying concrete surface from moisture and water accumulation, as wells as extreme weather conditions. It enhances the beauty of a surface: The waterproof paint has attractive colors that have enhances the exterior look of your house. It also gives your basement and garage area a great look. It is permeable: It allows moisture to escape from the concrete surface. It is durable: It can last up to 25 years which lasts longer that regular painting. It covers scars and cracks: The paint covers existing scars and cracks on the surface leaving the area even. Adds value to your property: It brightens and transforms your house into a new look that adds the resale value of your property. Resistant to algae growth: The paint does not allow algae and molds to grow on surfaces. It helps your building to look good for long. Easy to clean: It is easy to clean surfaces after the waterproof paint has dried off. It is resistant to chemical detergents. It gives you a variety of options: The paints come in different colors and thickness. The homeowner can choose what color to paint in the building. Withstand different weather conditions: It can withstand extreme weather conditions. It is waterproof. Therefore water does not affect this paint. Our job at Waterproofing Singapore is to give you the best waterproof paint option that will suit your needs. Our services are easily accessible, and we are always ready for you. Contact us today for more information.